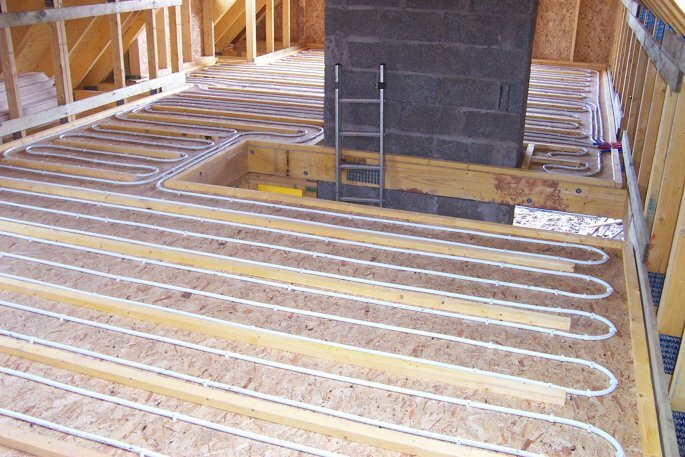 In the upper floor now you can see the underfloor heating pipe going around the end of the battens discussed in the suspended timber floor construction diagram. To the right of the chimney breast you can just see the pipes with their red and blue sleeves, disappearing into the eaves where the underfloor heating manifold is situated. The manifold has to be readily accessible to allow occasional inspection of the underfloor heating system water temperature and pressure gauge, so a small door on this part of the wall will make a discrete cupboard.